As much as a GSX-R1000 owns the racetrack, the 2019 GSX-S1000 owns the street. Developed using the attributes of the championship-winning 2005-2008 generation GSX-R1000 engine, this naked sportbike carries Suzuki's performance spirit to every ride. 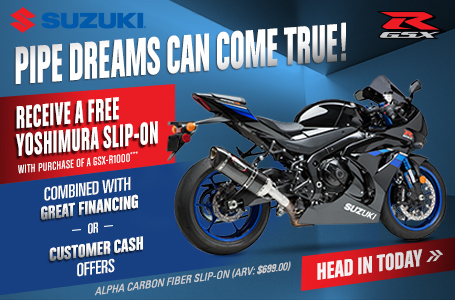 The GSX-R connection does not stop there, as the GSX-S1000 shares other chassis technology and components so this bike can carve up the corners while providing all-day riding comfort. It's more than just an attitude, a spirit, or a lineage though; it's about performance-packed hard parts evolving from one generation to the next. The GSX-S1000's 999cc inline four-cylinder powerplant is based on the legendary long-stroke GSX-R1000 engine. That generation engine is the ideal choice to build a liter-class, naked sportbike around, as it makes strong peak power with a robust torque curve that delivers street-dominating power. For 2019, further refinement to the engine's throttle control mechanism helps the rider smoothly apply the power on any type of road. There are electronic rider aids lifted from Suzuki's supersport bikes, such as the Suzuki Advanced Traction Control System*, plus the Suzuki Easy Start and Low RPM Assist systems. The chassis also benefits from GSX-R influence, through the fully adjustable, inverted KYB fork and easy-to-adjust rear shock. Stopping performance is stellar via the dual, ABS-equipped** radial-mounted, four-piston front calipers and 310mm floating rotors. The wide Renthal Fatbar handlebar provides a comfortable reach and the proper leverage to hustle the GSX-S1000 through the corners. 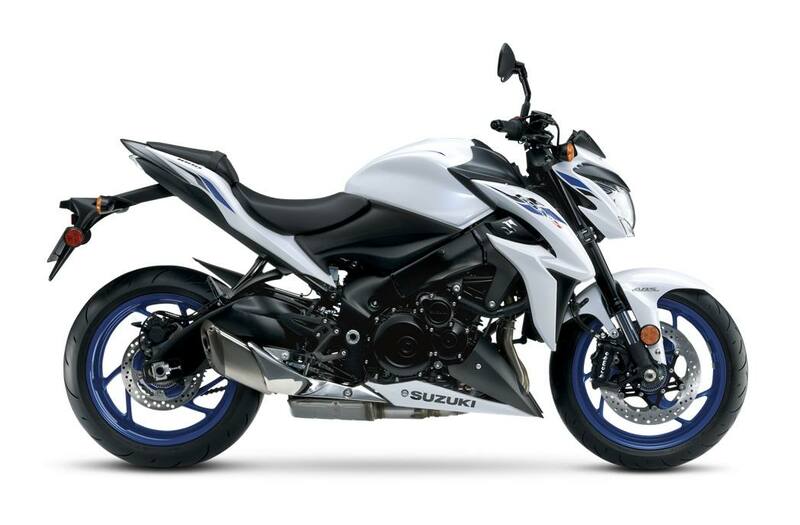 Top that chassis performance off with aggressive styling coated with Pearl Glacier White paint and sparkling blue wheels, and you have a naked sportbike ready to attack the road as it turns heads on the street. *The Traction Control System is not a substitute for the rider's throttle control. It cannot prevent loss of traction due to excessive speed when the rider enters a turn and/or applies the brakes. Neither can it prevent the front wheel from losing grip. 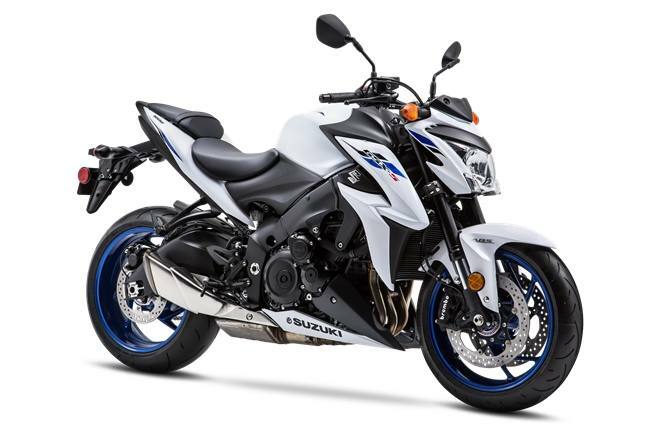 Using a design similar to the GSX-R1000R, the GSX-S1000's Suzuki Clutch Assist System (SCAS) drive line smooths shifting and engine braking. The EFI system uses Suzuki's proprietary SDTV (Suzuki Dual Throttle Valve) throttle bodies where the secondary throttle valves are controlled by a servo motor for smooth power delivery. The sculpted muffler has a pleasing appearance that's not common to under-chassis exhausts while creating an exciting, distinctive sound. Suzuki's Advanced Traction Control System* lets the rider control the throttle with more confidence in various riding conditions. As a result, the rider can enjoy sport riding with less anxiety. There are four traction control modes (1, 2, 3, and OFF) that the rider can easily adjust at rest or on the fly via a handlebar-mounted control. The difference between the modes is their sensitivity to road conditions.• Mode 1 is the lowest sensitivity level; most suitable for skilled riders or in conditions that have good road surface grip (sport riding on good, smooth roads).• Mode 2 is a moderate sensitivity level; suitable for most riders or in conditions that have varied road surface grip (city riding, regular road conditions).• Mode 3 is the highest sensitivity level; suitable for road conditions where the grip may be limited (wet or cold surfaces).• OFF disengages all traction control features. New black finish on the shifter, rear brake and both hand levers matches the performance nature of the motorcycle. The GSX-S1000's naked roadster bodywork is designed to look wild, rugged, and aggressive—and to keep the rider comfortable at all times. The GSX-S1000 premiered Suzuki's Easy Start System that requires just a simple touch of the starter button to fire up the engine (without pulling the clutch lever if the transmission is in neutral). A variety of Genuine Suzuki Accessories, such as a solo seat cowl and sport screen, are available, plus a large selection of logo apparel.